Survivor: Vanuatu (2004) - 8th place, 11th out - 2nd juror. 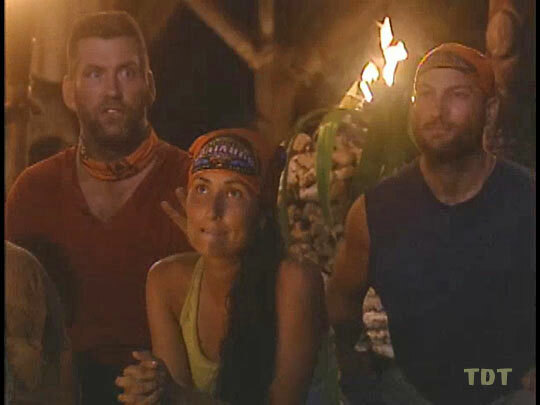 Voted out in Episode 10, "Culture Shock and Violent Storms" (Day 27). Vanuatu Ep. 2 RC: "By the Numbers" - One of seven Lopevis not to get across; Lopevi loses again. Vanuatu Ep. 2 IC: "Four on the Floor" - Tethered to Rory and Chris, collects pieces, and finally, Lopevi wins! Vanuatu Ep. 3 RC: "Great Escape Run" - Participates; Lopevi wins reward. Vanuatu Ep. 4 RC: "Remembrance" - Makes one of only two Lopevi matches (shown); Lopevi loses. Vanuatu Ep. 4 IC: "Tribal Tiles" - Places tiles for Lopevi, which loses again. Vanuatu Ep. 5 RC: "Dive Masters" - Now with New Lopevi, dives, and Lopevi wins. Vanuatu Ep. 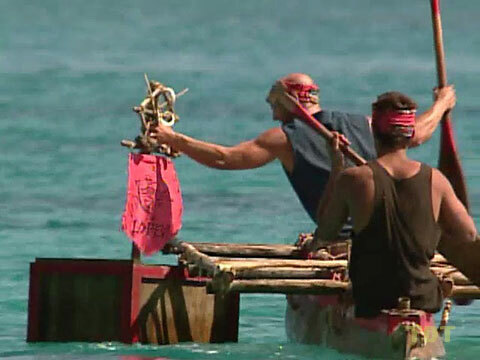 5 IC: "Outwit, Outplay, Outrig" - Paddles with John K.; new Lopevi wins. Vanuatu Ep. 6 RC: "Pig Pen" - Carries pigs, new Lopevi wins again. Vanuatu Ep. 6 IC: "Strung Out" - With Twila, works the final stage, and new Lopevi wins once again. Vanuatu Ep. 7 RC: "Jo Coconut" - Competes, and somehow, New Lopevi finally loses. Vanuatu Ep. 7 IC: "Shoot Your Way Home" - While he breaks several plates, Lopevi narrowly loses again. Vanuatu Ep. 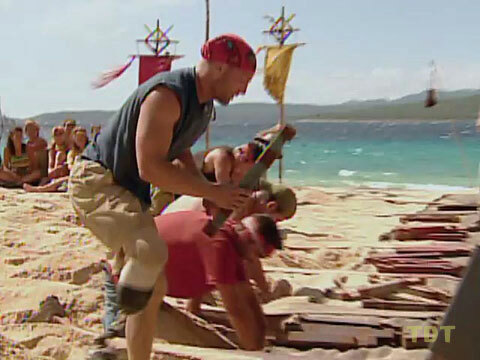 8 RC: "Fire Fighter" - New Lopevi wins the last tribal challenge. Vanuatu Ep. 10 RC: "Sacrificial Lamb" - Part of the winning team, with Chris, Eliza, and Ami. Vanuatu Ep. 3 IC: "Great Escape Run" - First to start his puzzle, but does not win (2nd/8). Vanuatu Ep. 8 IC: "Jumper" - Slips on the platform, just missing the second round (bottom 6/10). Vanuatu Ep. 9 RC: "Head Hunter" - Targeted by the women and out immediately (8th/9). Vanuatu Ep. 9 IC: "Memory Mosaic" - Eliminated in the first round (bottom 3/9). Vanuatu Ep. 10 IC: "Get A Grip" - Holds on for dear in-game life, but eventually outlasted by Twila (2nd/8). Vanuatu, Ep. 1: Brook Geraghty (voted out, 5-4). Vanuatu, Ep. 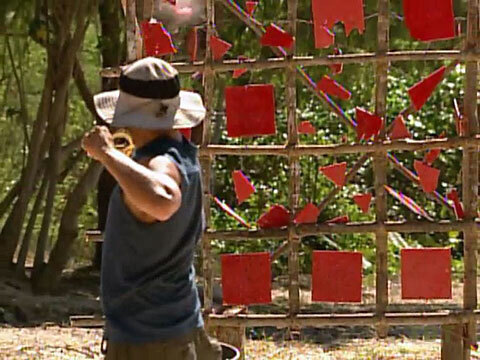 3: John Palyok (voted out, 5-3). Vanuatu, Ep. 4: Brady Finta (voted out, 6-1). Vanuatu, Ep. 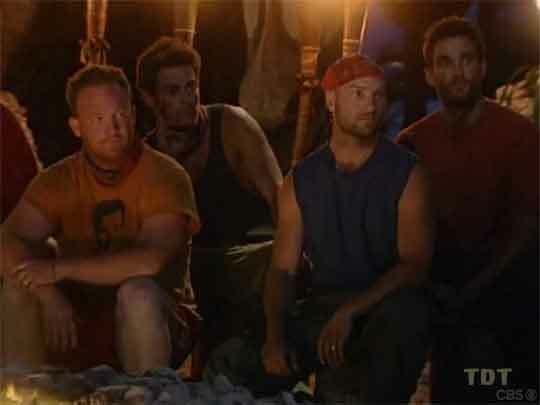 7: John Kenney (voted out, 5-1). Vanuatu, Ep. 7: One vote, from John K.
Vanuatu, Ep. 10: Six votes, from Twila, Scout, Eliza, Julie, Ami, and Leann (voted out, 6-2). Vanuatu, Ep. 14: Voted for Chris Daugherty (who won, 5-2). Mmm, leftover bones! This is awesome! Y'know, I JUST thought of this: maybe we should recruit Eliza, instead of target her? You guys have any kava? Angel Cohn at TV Guide Online (11/23/04): "Survivor's Chad Hanged"
David Bloomberg at RealityNewsOnline (11/24/04): "'It Is Uncomfortable Knowing You Are Being Judged on Your Gender': An Interview with Survivor's Chad"
LauraBelle at RealityShack.com (1/20/05): "Interview with Chad Crittenden of Survivor: Vanuatu"
"James 'Chad' Crittenden was born on a military base in Oceanside, California. Growing up in Half Moon Bay, California, he discovered a love of sports and the outdoors, particularly soccer and fishing. Crittenden attended Half Moon Bay High School, where he participated in many sports (soccer, tennis, bowling, fishing, running, mountain biking) as he pursued a collegiate future. After high school, Crittenden decided to work at a local community college before pursuing studies at the University of California at Davis, majoring in International Relations with an emphasis on world resources, the environment and Spanish. Upon graduation, he accepted summer day-care jobs that ultimately led him to an after-school tutoring program. From there, he accepted an offer to head a new bilingual tutoring program in San Jose. Two years later, an internship where he taught a bilingual second grade class launched his career. After two years teaching in San Jose, Crittenden accepted a teaching contract in San Salvador, El Salvador, where he met his wife, Dyann. Upon returning to the US, Crittenden and his family settled in the San Francisco Bay area. They have two children, Clara (3) and Trevor (4 months). About one and a half years ago, Crittenden went to the doctor to have a lump on the bottom of his foot removed and discovered find it was a cancerous tumor. Synovial Sarcoma is a rare and deadly form of cancer (comprising less than one percent of all cancers) and amputation was necessary just below the knee. His recovery was miraculously quick, and he completed a triathlon nine months after the surgery. After many prostheses and much development, he feels that he has almost reached his post-surgery potential. Crittenden has been cancer-free for almost two years and has decided to take a leave of absence to be a full-time dad, which he has been planning for some time. He looks forward to the adventure. Crittenden's birth date is August 8, 1969."